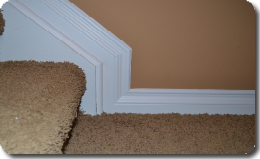 Are You Looking for Crown Molding in Northville, MI? Timothy Miller Carpentry offers crown molding in your neighborhood and is licensed and insured in the State of Michigan. Trust Our Quality and Craftsmanship to Install your Crown Molding. Next to your family, you value your home the most. Timothy Miller Carpentry understands that and that’s why we have worked so hard to establish ourselves as the trusted leader to install your crown molding in Northville, MI. Timothy Miller is on every job and he applies his 15 years of experience in the Carpenter’s Union to each detail of every project. Based in Canton, MI, Timothy Miller Carpentry has earned the trust of area homeowners. They know he is honest, dependable and cares about their homes in Northville, MI as much as they do. For the best work and the greatest value in your crown molding project, contact Timothy Miller Carpentry today to schedule a free estimate at (734) 765-4801. You can trust us to deliver the quality job that you demand. Besides the quality products and materials that we use for your crown molding, you can expect top notch craftsmanship. We maintain a safe work environment and clean up at the end of every day. We do not accept final payment in Northville, MI until your job is complete. You don’t pay until you’re satisfied with our work. Timothy Miller Carpentry has been in the construction trade over 25 years. We are a company that stands behind our exceptional experience, reputation and image in Northville, MI. Timothy Miller Carpentry can answer any questions that you have pertaining to your crown molding project in Northville, MI. The owner provides his personal cell phone number and is available virtually any time to discuss any questions or concerns. We return your call in a timely manner. Upon request, we will provide as many crown molding references as you would like. Referrals and repeat customers in Northville, MI have allowed us to prosper in this time of economic hardship. We are in the business to stay in business. Your estimate is clear and specific regarding the completion of your project and meeting your goals. Our primary goal is to give each and every customer a friendly, satisfying experience with their crown molding and have them remain our customer for years to come! Timothy Miller Carpentry is licensed and insured in the State of Michigan. Choose us for your crown molding Northville, MI needs. Contact us for a free estimate at (734) 765-4801. Copyright 2014 © Timothy Miller Carpentry. All rights reserved.